I have at least one friend who admits to “hyper miling,” or watching the MPG gauge at all times and trying to keep his average as high as possible. In one way I find this to be a fascinating task that one could use to study multiple-cue learning, pattern recognition, or adoption of superstitious behavior. (After all, was it kicking the car to neutral that saved you that .0005 gallons or the slow acceleration after the stoplight?) In another way I find the amount of attention dedicated to monitoring an in-vehicle interface alarming. As far as I know, the only display that allows hypermiling shows the current MPG and an average MPG. You have to experiment and learn for yourself what speeds under what conditions change your MPG, and you learn this via the numbers shown. This requires you to remember previous numbers and compare your current performance to past performance. A portion of the dash display is dedicated to a game. 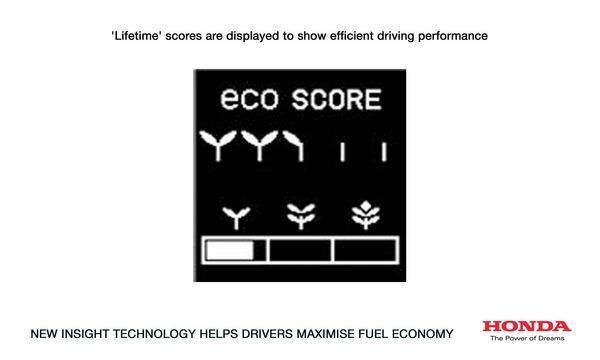 Instead of depending on the intrinsic reward of keeping up with your MPG, the Honda will grow you a tiny electronic tree as you cumulatively save gas while driving. I think this is an incredible idea that will create hypermilers out of normal people and absolute fanatics out of hypermilers. Aesthetically, I’d have made this a little seed that grows into a pretty tree, but I’m sure Volkswagen will eventually run with an idea like that for their implementation. What kind and amount of attention is dedicated to this display? Green AND blue are fatiguing colors for night driving. You can turn the display off, but who will actually recognize it is the colors that are making night driving more difficult? Thanks to Rose Marie Yagoda for sending me the original post from Engadget.